Note: One or more features described in this document may not be enabled in your domain. Contact your Echo Administrator for more information. Year-long courses can often broken into one or more terms (i.e. quarters, semesters or trimesters). It is best practice to define the school year and grading periods school-wide rather than course by course. Your Echo Administrator should have already configured your Echo domain with the school year and grading periods information. If not, you can still use Echo's grading periods feature to break up your course into terms. Note that courses can be divided into semesters, trimesters or quarters, but a semester cannot be divided again into quarters. If you require a course that averages quarter grades to produce a final semester grades, you must use a separate course for each semester. Remember to make these changes in your master course so that any derivatives inherit the changes and stay aligned with the master. If your domain has domain defined school year and grading periods. If your domain doesn't have domain defined school year and grading periods. If your domain has the school year and grading period defined, you likely selected the school year when you created the course. this would have automatically set the course start and end date and added the grading periods. To update an existing course, use the Course Settings page to first select the school year from the drop down menu. If the school year options are not listed in a drop down menu, ask your Echo Admin about setting them up in your school's domain. 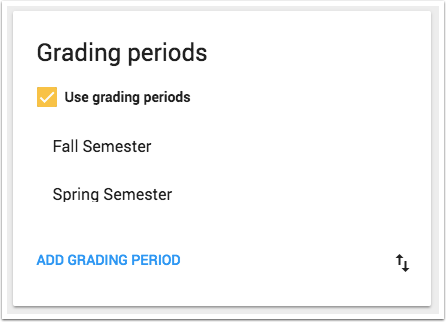 Next, use the "Grading Periods Panel" to select the grading periods that will be used in the course. 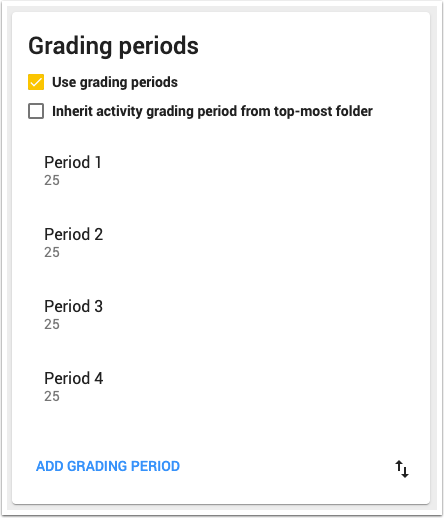 The "inherit activity grading periods from top-most folder" makes it easier to organize your course materials by associating all items within a folder to the same grading period as the folder. 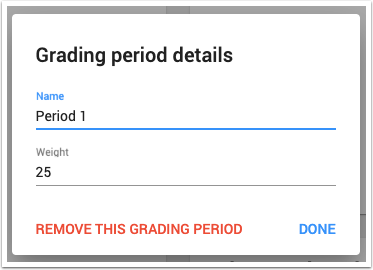 Use the drop down menu to select the desired grading period. If your school uses weighted grading periods (i.e. 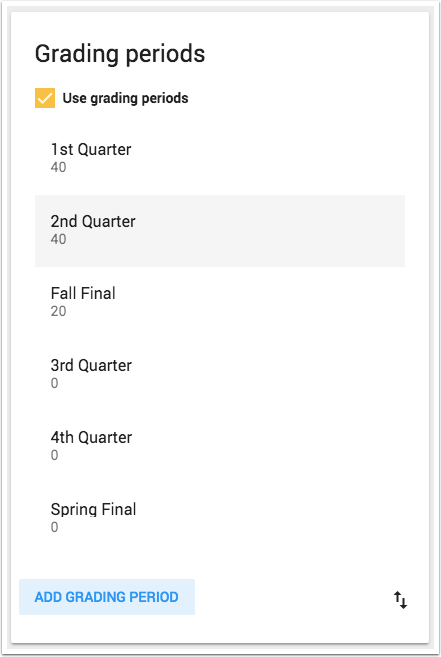 final semester grade is average of quarter one and quarter two), you can edit the weighting as well. Click on the grading period title to edit. If you domain doesn't have grading periods defined, you can still add them to your course. Note that assumes you want to use a weighted average to create a "final" grade in the course (i.e. averaging quarter one and quarter two). If you would like a grading period to be ignored until the final grade is calculated, you must give the category a "0" weight to omit if from the calculation. 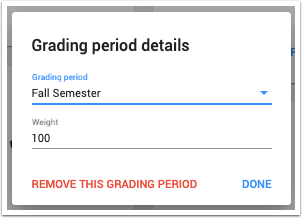 To enable grading periods in your course, locate the grading periods panel in the Course Settings page and check the "Use Grading Periods" box. This will expand the panel and will display four default grading periods. 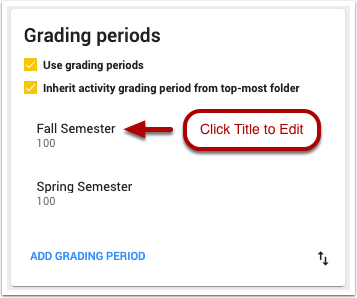 The "inherit activity grading periods from top-most folder" makes it easier to organize your course materials by associating all items within a folder to the same grading period as the folder (recommended). To edit a grading period, click its title. This will open a new panel that allow the title and weight to be changed. Year-long course divided into two semesters (no weighting). This configuration will create two separate semesters each producing a separate and independent grade. To temporarily ignore a grading period, set the weight to "0". Single year-long course using weighted grading periods. In some cases, teachers must use a single year-long course that also uses grading periods (i.e. an integration with an external SIS prevents using separate courses for each semester). In this case, the course should contain all the grading periods for the year. Durring the first semester, the second semester grading periods should be weighted "0". Then, at the semester mark, the weighting should be flipped so that the first semester's grading periods weight is "0". See the example below. 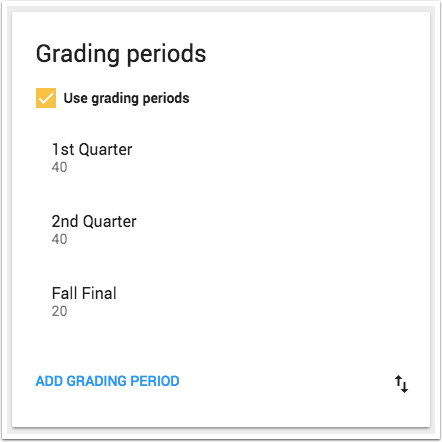 For more information on using grading periods, see How do I enable grading periods in my course? If you don't see the option to enable grading periods, contact your Echo Administrator and request that this feature be enabled for you.